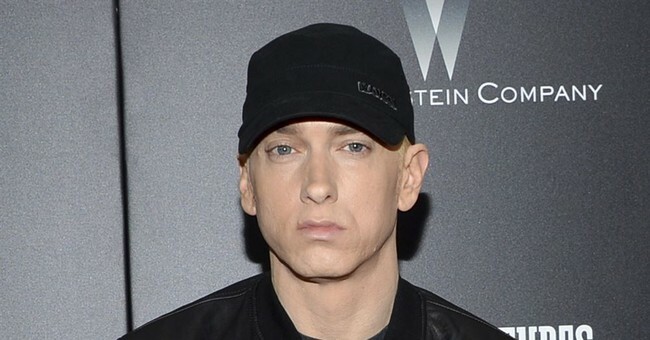 The rapper Marshall Mathers, AKA Eminem, has fallen on hard times recently, But, it is the fact that the President has not even acknowledged his anti-Trump free style from the 2017 BET hip-hop awards that truly irks his melodic soul. Appearing on an XM radio station this week, Eminem said he was "extremely angry" that President Trump hasn't even so-much as tweeted about that appearance, reports Newsweek. That freestyle, seen in the video below, had some poignant lyrics for the commander-in-chief. "But we better give Obama props/'Cause what we got in office now's a kamikaze/That'll prob'ly cause a nuclear holocaust"
At one point in time, President Donald J. Trump had glowing reviews of Eminem. Donald Trump appeared on MTV's 2014 "Shady Nation Convention" and had the following to say about Eminem. "Of course I’m right, I’m always right — I’m Donald Trump, I’m always right!” Trump bellows from the podium as he picks up speed. “I know a winner when I see one! And Donald Trump is telling you, right now, Slim Shady is a winner!" He also previously said that Eminem was one of favorite music choices. Eminem received glowing praise from liberal media outlets for his anti-Trump credo. "Why Eminem's rap about Donald Trump is resonating with millions of American-Detroit rapper uniquely qualified to provide cutting critique of President" wrote the Independent. The Atlantic gave a more nuanced approach with their article, "What Makes Eminem's Trump Diss Special (and What Doesn't)." Still, this could not grab the attention of President Trump. In the grand scheme of things, does any of this matter? Was Eminem trying to establish a diplomatic discussion of the current political world with the executive branch? Does he miss the accolades of previous years from Donald Trump? Who knows, who cares.